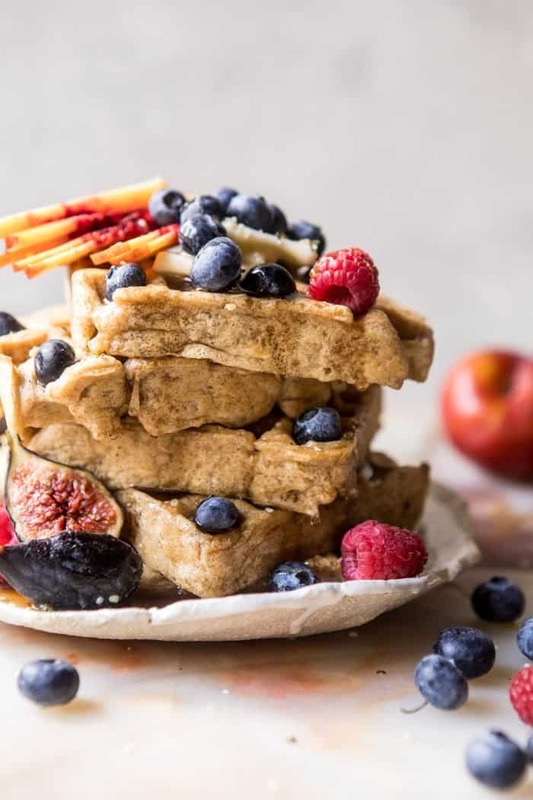 Everyone knows the month of August is back to school, but for me, these freezer friendly whole grain waffles are also back to childhood. Last week it was these homemade blueberry Nutri Grain bars and this week it’s freezer friendly waffles! 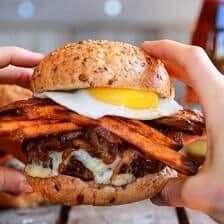 It might be kind of odd, but I’m loving these childhoods eats, especially with everything that’s been happening in life, it’s nice to be going back to comfort foods from when I was a kid! Growing up Eggo Waffles and Einsteins Bagels were pretty much breakfast staples…meaning my mom never ran out…hey, she needed to be able to sustain life for my brothers! Fortunately, I could get beyond waffles and bagels, with good old toast and eggs + bowls of cereal or just fresh fruit, but the boys…not so much. However, even today I’ll sometimes catch myself missing that buttery deliciousness of a good ole freezer waffle. I know, I know, like what?! But guys, come on…those waffles were kind of good. Granted, a lot of things are good when LOADED up with butter, but I do remember loving them. This is scary to admit, but my brothers probably still eat them…often. All that said, I can’t even begin to remember how long it’s been since I had a waffle from the freezer, so my memory might be a little off. Nevertheless, I am so happy to be bringing a much healthier, and much, much more delicious, breakfast option to the table today. Homemade freezer friendly waffles…with whole grains, plus my favorite Almond Breeze Almondmilk. Yes, REAL food…Yeah! The waffles are made up of the simplest ingredients. Whole wheat flour, oats, almondmilk, eggs, a little vanilla, and a pinch of cinnamon. Then just cook them up in a waffle iron (any shape or size works, but I love this square waffle iron). If you can’t eat the waffles right then, simply let them cool, freeze, and when ready to eat just pop them into the toaster (this is my favorite toaster, so cute). These are such a delicious option for busy mornings. 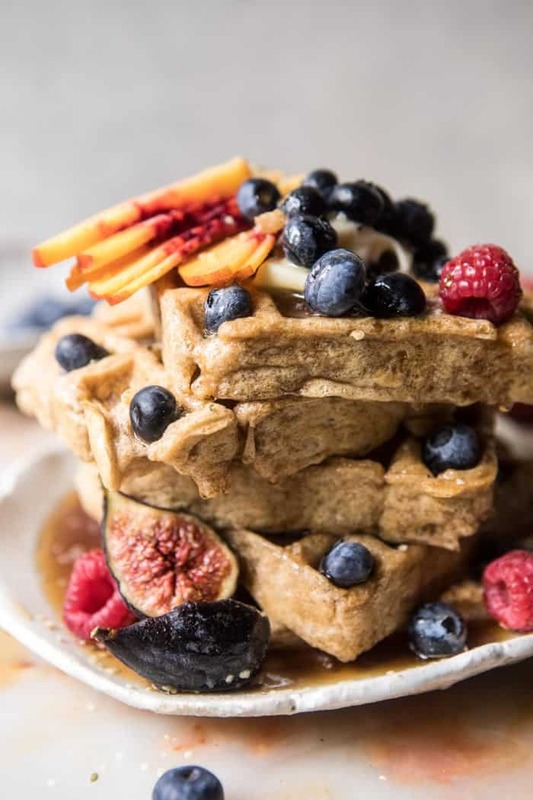 You can top these waffles however you please, but for quick mornings I love smearing them with a little butter, topping generously with fresh fruit, and drizzling with maple syrup. 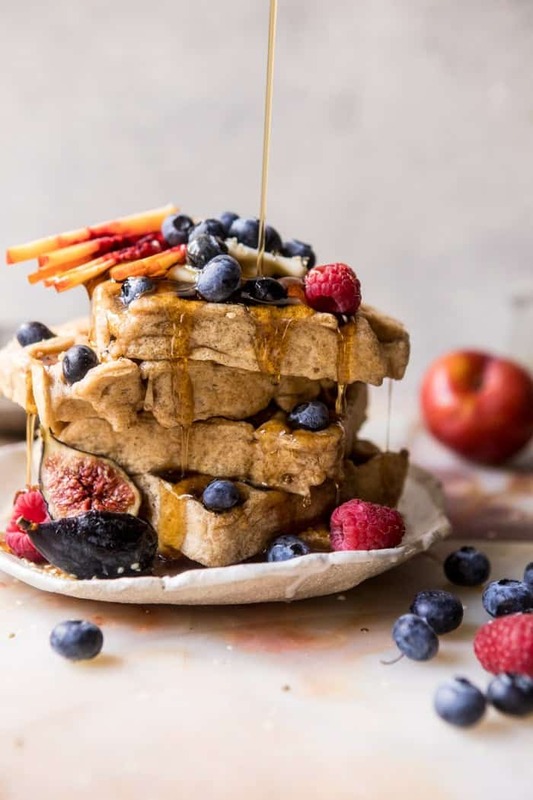 These certainly are not the Eggo waffles I grew up with, but that’s A-OK because these are a giant upgrade –> hello to soft, fluffy whole grain waffles that will keep us (meaning your kids, husband, wife, boyfriends or whomever) full until lunch. Alright and lastly, I have something super fun to finish this post off with! It’s giveaway time! 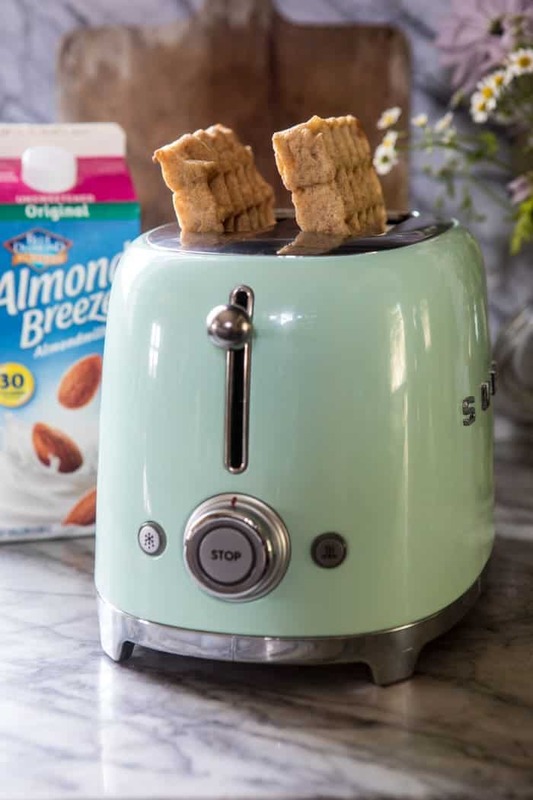 Over the past few years I’ve partnered with Almond Breeze to bring you not only this post, but many, many others as well (see here for past posts). –> head over here and complete this quick survey. –> then come back to this post and leave a comment telling me your favorite childhood recipe. I’m so curious to know what you guys loved as a kid! –> I will pick a winner and shoot that person an email. –> the survey/giveaway is open for ONE week, and only to those residing in the US (sorry everyone else!). 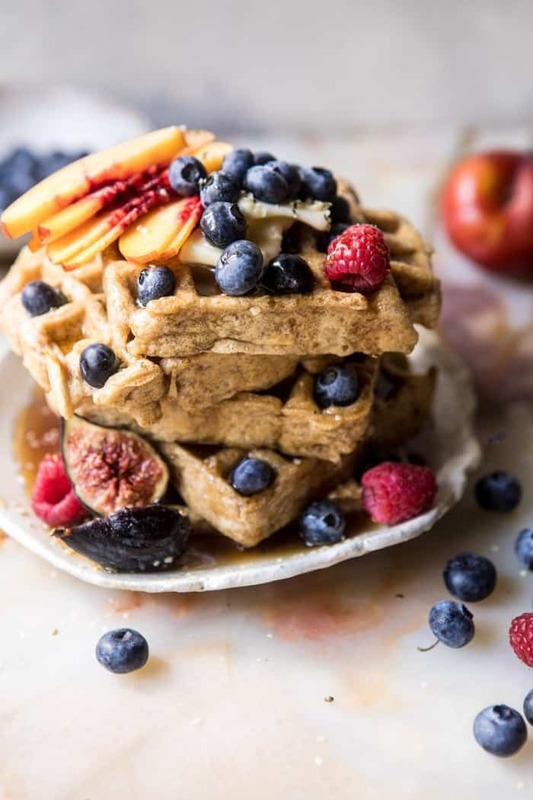 These whole grain waffles are freezer friendly, so great for meal prep! 1. 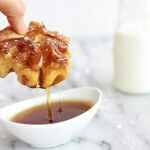 In a large mixing bowl, whisk together the Almondmilk, eggs, melted unsalted butter, honey, and vanilla. Add the flour, oats, baking powder, cinnamon, and salt and stir until just combined. It's OK if the batter is a little lumpy. Allow the batter to sit 5-10 minutes. 2. Preheat your waffle iron. 3. Cook the waffles according to your waffle iron's directions. Serve topped with fresh fruit and maple. 4. TO FREEZE: Cool the waffles completely on wire racks. 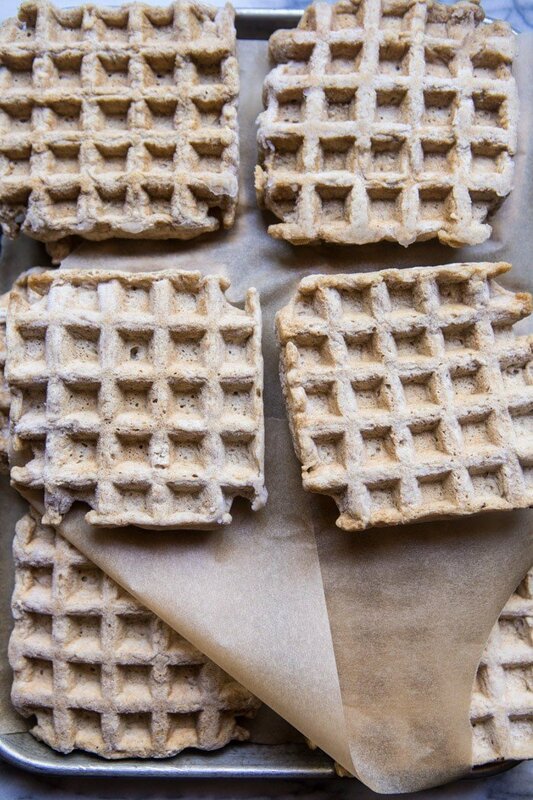 Line a baking sheet with parchment paper and place the waffles in one even layer. 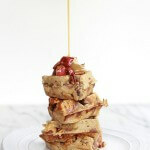 Place another sheet of parchment over the waffles, then arrange another layer of waffles over top (see photo). Freeze 2 hours and then transfer the waffles to a freezer safe bag. To cook, add the waffles to a toaster and toast until warmed through and crisp. Then make waffles…for breakfast, lunch, or even dinner! My favorite childhood recipe = my mom’s specular homemade spinach quiche. The aroma, flavors, textures… it was a signature dish served for special occasions/holidays/family get-togethers, and definitely was my favorite childhood recipe. Awh sounds amazing Liz. I love when recipes are shared and loved by my whole family.. its like a comfort meal for sure! That sounds so yummy! & Thanks so much! I always loved when my mom made Mexican Lasagna! My love of this recipe must translate into my cooking because my husband’s favorite dish that I make is your Mexican Lasagna Roll-Ups! I’m actually even making them tonight per his request!! That is awesome! I am so glad you two love that recipe Kacie! We call it “Avery’s favorite chicken” and it came from some mid-90s baby food cookbook. It’s a jar of apricot preserves, a jar of Major Grey’s chutney, a big spoonful of mayonnaise, some Worcestershire sauce, and lemon juice, mixed up and spread over chicken. It sounds DISGUSTING but it actually kind of works. Haha definitely sounds different, but I’d give it a try! Thanks Avery! These look great! I was really into making and freezing waffles for a while, but then switched to making and freezing pancakes. I should switch back to waffles now 🙂 I filled out your survey too. Waffles are just the bomb! haha! Thank you for taking the survey Barbara! My favorite childhood meal was steamed artichokes with buttery noodles! Ultimate comfort food for me. YUM YUM YUM! Love the sound of that! Ooo this sounds a lot like my little sister Asher! She LOVES cinnamon sugar toast and toast with nutella on it! I used to love making blueberry compote with homemade buttermilk pancakes. Or crepes stuffed with fresh fruit and chocolate chips!! Wow that sounds so good! Thanks Stephanie! The last few days I have been getting your updates on bloglovin’ instead of getting them from you. Hi Charlotte! So sorry for the trouble. We had some email trouble last week, but it is all fixed now. Please let me know if you are still having trouble and I will take care of it for you! Again, so sorry for any inconvenience. I bet that way so yummy! Food that brings memories is always the best, even if it isn’t too out there! My favorite dessert was warm coconut pudding with melted chocolate chips swirled thru it. YUM! That sounds like an amazing dessert! My mom used to make turkey-tortilla casserole and it is my favorite comfort food. It is literally just flour tortillas, plain tomato sauce from can, shredded Tillamook cheddar cheese and shredded turkey. It’s super basic, but it’s my favorite! Sounds like an amazing comfort food! Thanks Hillary! My favorite childhood recipe is my mom’s lasagna! I thought it looked so gross sitting on the table when I was little. My dad suggested that I shouldn’t complain about food that I’ve never even tried. I took a bite and have loved it ever since. I don’t think this recipe has any secret Italian twist to it — it’s just the flavor combinations that I grew up with that I don’t think compare to anyone else’s. Mom always makes it the best!! Sounds like a great childhood favorite! I’m slightly embarrassed to say that I LOVED hamburger helper… especially when my mom added mushrooms (I was a weird kid). I also loved Rice-a-Roni, Pasta-Roni or any of those horribly processed meals! Thinking back to all of this… I’m very glad I eat healthier now! Haha I am sure a lot of kids still love those! Thanks Libby! Thanks so much for filling out the survey Kiara! I hope you love these waffles! Hands down, for breakfast, French toast was a childhood favorite! Eggy, crispy exterior cooked in lots of butter, and a soft spongy texture inside perfect for absorbing that syrup. YUM Making myself hungry here. 🙂 Thanks for the wholesome waffle recipe. I am more of a traditional crispy waffle gal myself. French toast was one of the bests! I hope you love these waffles Carol! Thank you! My grandmother made the absolute best potato salad! She taught me and I have taught my kids. Awh! What an awesome tradition! We have a few recipes that were passed down in my family and they’re definitely my favorites! Thanks Oleva! As a kid I always loved my mom’s homemade goulash. I still love it now. Simple yet delicious. My grandma’s fried chicken was my request for every single birthday. It was amazing. But…I’ve been vegetarian for 14 years. If Gran was still alive, I know she’d be making me Fried Tofu the exact same way she made her chicken. I sure do miss her. Awh that is so sweet! Thinking back to childhood the thing that stands out for me is a little odd but as a kid I always looked forward to the pâté that was served at my grandparents house on Christmas Eve (plus, it was Christmas-time!). It was chicken liver and rich and so good spread on crackers and I felt so fancy eating it until my 10 year old self found out that it was actually chicken livers and then I didn’t touch the stuff until I grew up a bit. Now I make a version that’s a little more upgraded than what is served on Christmas Eve (yes, it’s still a staple in my family) but I will always have a dollop or two or ten of that pâté on crackers and remember the feeling of being a kid again. That sounds amazing Jessica! I was totally like that too when I was little.. I liked something until I found out what it really was. & Now loving those things again! My mom made the best twice baked potatoes. I loved it when she made them to go with dinner. Twice baked potatoes are so good! Thank you! Mac and Cheese… my favorite as a kid. Always loved mac and cheese.. I think its still a favorite lol! Thanks Emily! Yum! Mom’s food is always the best! I absolutely loved the baked ziti my mom used to make. I have now recreated it by incorporating pumpkin. YUM! Love that! Thanks Christina! My favorite childhood recipe and still a comfort food is Chicken and Dumplings. Yum! PB cookies are so good! Thanks so much for completing the survey! Sadly, I am allergic to chocolate so my sister would make me butterscotch chip pancakes, my favorite childhood breakfast. Oh no! That would be so hard in my family since we are always eating chocolate haha! Also, what a nice sister! Thanks Staci! Hands down my favorite childhood breakfast, and still till this day, is my grandma’s biscuits and gravy. The ultimate comfort food. The ultimate comfort food! Sounds amazing Natalie! Awh sounds amazing! Thank you Lauren! I was a pretty picky eater, which led to a lot of pasta…but what I especially loved was my grandmother’s homemade sauce! She would make it every summer and freeze some for later in the year. Super fresh tomatoes, basil from the garden, toasted pine nuts…it was light but so flavorful and fresh! YUM!! That sounds like such a great pasta sauce! I love sauces made with the freshest ingredients.. the BEST! Thanks Victoria! For an embarrassingly long time, I survived on two things: mac & cheese, and something my mom made up called “scooby doo carrots”. They were carrots cooked in butter and brown sugar – so much for the illusion of good health! My mom really had to get creative to get me to eat even a sugary vegetable. She told me Scooby Doo got his 20/20 vision to solve crimes by eating carrots. And I remember constantly squinting my eyes while eating them to see if I was getting better eyesight. Haha awh!! That is such a cute story Kelly! I love hearing the ways mothers get their children to eat their veggies.. One was pretending to be a dinosaur to eat broccoli lol! Thank you for sharing! Awh that is so sweet of her! Thanks Natalie! Haha me too!! That sounds so amazing! My favorite childhood recipe has *hands down* got to be my grandmother’s marinara, known lovingly to us as “Sunday Sauce” sauce over any type of pasta. Raised in Naples, my grandma immigrated in the early 1930’s, and she never quite gave up her Italian heritage. I’m thankful for that though because of her absolutely delicious cooking! Every Sunday growing up we would load up my family of 6 and head to Nonna’s for “Sunday Sauce” (also, I am so very sorry for the loss of your grandmother, Tieghan. My Nonna died about 7 years ago, and I miss her always). To this day, my extended relatives still gather together to enjoy “Sunday Sauce,” whether it’s on a lasagna, ziti or simple spaghetti–there’s no going wrong with some home-cooked and well-loved meal. Wow what an amazing family tradition & one I hope you guys forever keep! Thanks so much for sharing Andrea! My favorite childhood breakfast recipe were these mini orange muffins my grandma made and then rolled in butter and cinnamon and sugar. All these years later after she passes when we tried to make them ourselves we were surprised to learn they were made with Bisquick pancake mix. Those sounds super good! Thanks Emmy! My favorite childhood recipe is donuts; my mom used to take out frozen bread dough and cut them in to donuts and fry them and then shake them in a paper bag filled with cinnamon and sugar. I took the survey too. 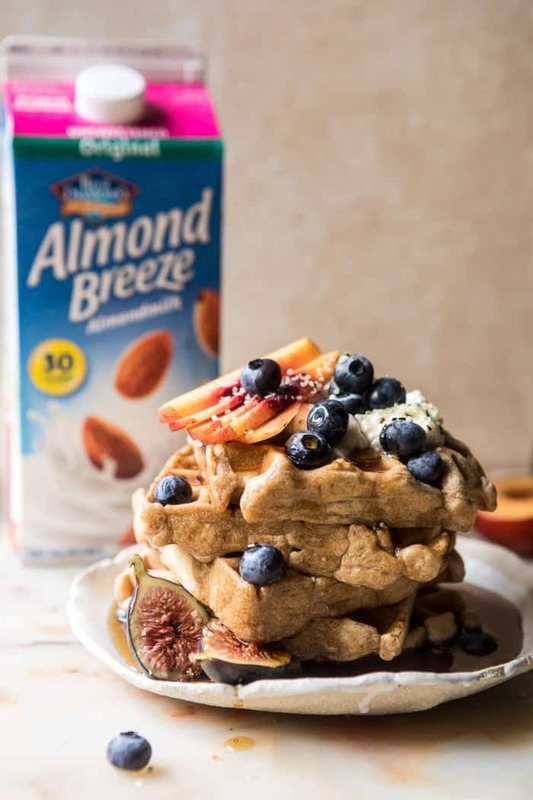 These waffles look amazing, will definitely try this weekend since I ALWAYS have Blue Diamond Breeze almond milk on hand–so much better than regular milk. Unsweetened vanilla is my FAV!!! Wow those donuts sound amazing! I hope you love these waffles Penny! Thanks! Nana’s baked Mac and cheese with crackers on top! Chicken Delicious – a Crock Pot meal my mom made! Totally making these, so much cheaper and easier! My favorite childhood recipe was my mom’s Chicken Divan. Lots of curry powder and lots of lemon juice! Yum! love curry powder! Sounds amazing Gabrielle! Favorite childhood food was thumbprint cookies I made with my mom as a little girl and filled with raspberry jam! Awh sounds like a super fun memory to share with your mom.. oh and those sound delicious! 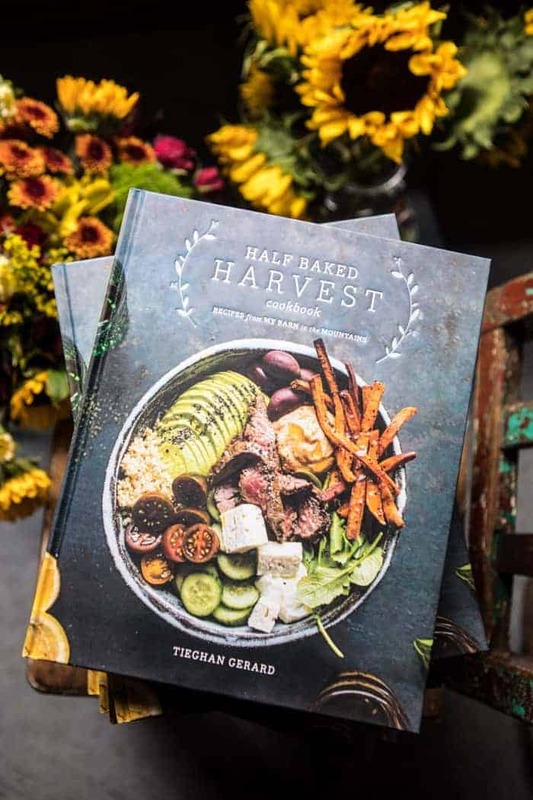 My mom was not a very adventurous cook when I was little (she has gotten more so, although that may be my influence–my cooking is often too outlandish! ); having seven little kids doesn’t necessarily make inventiveness a priority in the kitchen. The exception to this was her famous “boatfood”: billowy German pancakes topped with hot, homemade huckleberry sauce and a dusting of powdered sugar. My siblings and I dreamed about that breakfast! It still makes me a little giddy to think about. So good. That sounds like a great breakfast Kate! My favorite childhood recipe was making rice pudding with my grandmother. It holds dear memories of her and our kitchen times together where she would talk about her Latin roots. I loved the ooey goodness and she would always let me finish it with a nice big sprinkling of cinnamon. Best of all she let me have the first huge spoonful. Haven’t had such great rice pudding since then! Awh that sounds amazing Yvette! Thanks so much for sharing! Love these waffles! Growing up, blueberry muffins were. Special treat. My favorite childhood recipe is my grandma’s chicken and dumplings! Not to be confused with chicken and noodles, but the yummy doughy dumplings simmering in the thick hot broth with loads of chicken with it! We did not see my grandma very often due to distance, but she always made this for me when we visited. Even more special because you did not have it all the time! That sounds awesome Leah! 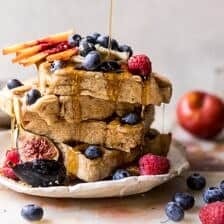 Excited to make these waffles – I am always looking for make ahead breakfasts that actually fill me up! Sounds so good! I hope you love these waffles Jessica! Growing up on a farm we always had the staple meat and potato meal … but when my Mom made lasagna for dinner, it was the best meal of the week. Pasta noodles covered with tomato sauce and lots of melted cheese!! Delicious. Lasagna is so good! And that one is making my mouth water!! Thank you for sharing Karin! Dosas! My mom’s south Indian dishes are my favorite, even as I cook and explore dishes from other cuisines, and crepe=like dosas are a long time favorite. Ooo yum! Indian dishes are very good and I am sure your mom made them the best! i must have been somewhat of a sophisticated child, because my favorite childhood food was stuffed onions. this sounds a little gross, but they’re actually amazing: small, sweet onions, stuffed with feta, breadcrumbs and some veggie or other, baked in the oven till bubbling and crisp. the best! I have never tried it that way, but I might have to lol! Thanks Maia! Without a doubt, my moms chicken and broccoli casserole! SHe passed away right after I graduated high school, so anytime I make it for my family, it bring s back such happy memories! It is amazing that your family has a dish to bring back happy memories! Love that! This isn’t much of a “recipe” but mac and cheese out of a box was a staple in my childhood and have to say the nostalgia is part of why I think it tastes so good today! Yep those were always good when I was little! It’s hard to pick a favorite recipe from childhood! My mom’s and my grandma’s waffles were actually some of my favorites. Also, mom’s lasagna and beef stew and homemade bread! YUM! One of the best combinations for sure is sauce and bread haha. Awh those sounds so good! A little memory from each person, so cute! my favorite recipe was peanut butter cookies! i’ve always had the worst sweet tooth. Oh same trust me! lol! I think my whole family still does haha. Thanks Courtney! I grew up in India. So store bought prepared food was a rarity at my house. It was always my mom’s fresh recipes with seasonal local vegetables. But once in a while, my mom used to make “Western foods” from recipe books. 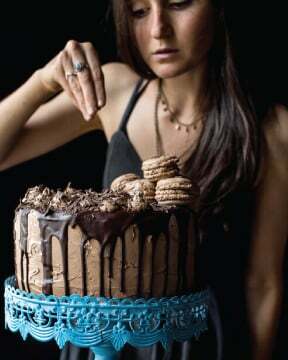 My favorite was “chocolate fudge” she used to make with cocoa, sugar, dried milk powder and cashews. Of course she “indianized” it with cardamom and other spices. Some of my best memories from childhood was eating chocolate fudge with my siblings after we came home from school. Survey for Almond Breeze almond milk is done. Their Almond milk is one of my favorites. I used to drink it regularly during my pregnancy. That is so awesome! I love that your family made everything homemade! The chocolate fudge sounds amazing and similar to what I had when I was little! Thanks for sharing Padma! Fried chicken is a childhood favorite! We used to spend our Saturdays at my great-grandmother’s house. She was an awesome, awesome cook who raised 4 boys on a dairy, and was used to feeding a army! 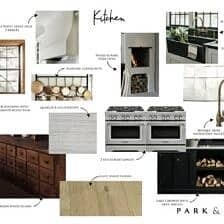 There was always SO MUCH food on the table, we would eat and eat until we were so full, and we would still have to stuff the fridge to fit in the leftovers!! My all time favorite diner she would make was fried chicken. She was raised in the south, and fried chicken, mashed potatoes, gravy, buscuits, corn, and green beans was her specialty. My whole family loved that dinner so much! Everything she cooked was great, but that was my favorite. She died 4 years ago, and I have not tasted any chicken as goood as hers since then, even though we have the exact recipe, and have helped her make it countless times. My mom’s green bean casserole!! Yes, frozen green beans, cream of mushroom soup and fried onions from a can. Yum. Food is about memories. My favorite childhood dish is my dad’s sausage gravy. It was a simple flour, milk, and pepper gravy…no frills. And we always ate it on plain white bread. He passed away when I was little; but 25 years later, I can still remember the way it tasted. And when I make it, it only goes on white bread! Spätzle! This is still a family favorite when we get together. These are so so so prefect for the school! So excited to try them out! So many favorites! But one that sticks out is my mom’s lasagna, which is the one I make to this day. Love it because we make it with a bolognese instead of marinara. And a bechamel sauce that makes it so creamy and delicious. Ultimate comfort food! I am not Persian, but for some reason as a kid my dad picked up a recipe for a version of Persian tahdig- which is rice steamed and cooked until it develops the most perfect sticky crust on the bottom – only he used a version that used potatos on the bottom layer of the pan. The simplest ingredients…rice, butter, oil, potatoes, and salt, but combined its the perfect side dish. 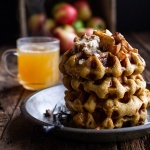 These waffles look and sound amazing! I am all about an easy make ahead breakfast that is ready to go in the mornings! 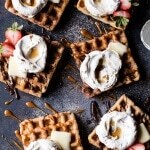 You know I’m all about waffles and my kids would absolutely love these! Those waffles are perfection! I can’t wait to try them. My favorite childhood recipe is tomato soup! Well, truly any soups my mom or grandma made, but tomato is probably my all time favorite. I absolutely LOVE it! My grandma made it with lots of dill and flat leaf parsley, but she left it in a bundle so she could fish it out before serving. The flavor was so incredible. Such a great back to school breakfast Tieghan! So satisfying! SO happy you like it Mary Ann! Happy back to school! I grew up in a poor family. As my mother was raising two kids all by herself, she needed cheap, quick, and delicious recipes so that we wouldn’t end up malnourished. 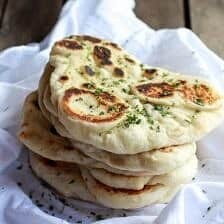 My favorite recipe has no English translation as far as I know (I’m from Russia), so I’m just going to describe it. Using a skillet, you fry onions with some oil, garlic, salt and pepper. Then you dump in ground meat (it’s usually beef, but it really could be anything). Once it’s cooked, you add tomato sauce and simmer. Then mix with pasta (shell, fusilli, penne, farfalle, whatever is in your pantry!). My favorite childhood recipe is my mom’s chocolate and butterscotch chip cookies. She would only make them at Christmastime and I could eat an entire plate all by myself. Now it’s my turn to make them for the family every Christmas and it is one of my favorite parts of the holiday. My childhood favorite was always macaroni & cheese. My mom would make it from scratch and even as a child I knew it was way better than the orange stuff. Fav childhood recipe? My mom is a wonderful cook, she’d make a big pot of spaghetti sauce on the weekends. She’d add meatballs and pieces of lean pork to braise in the sauce all day. They’d come out so tender, and served them with spaghetti. So good! My favourite childhood meal was fried pork chops and macaroni and cheese [You guessed it; I am from the South!]. Now that I am a vegan the chops are out, but the creamy mac and cheese [made with almond milk, of course] is still a fave! Thanks for such great recipes. OMG! These look divine! I love waffles and my mouth is watering! I love almond breeze milk so I use it all the time! My favorite childhood comfort food was my mother’s shepherds pie! She would make her own cream of mushroom sauce to put in the meat, with onions, and garlic, then saute the vegetables with butter and salt and pepper. Cover the top with creamy mashed potatoes, top with cheese and bake! Eat it with some crusty bread to soak up the sauce…one word…AMAZING! I’m coming over for breakfast! These look epic. Oh, I suppose I’m supposed to make them myself. FINE. I love your recipes! Since I am Spaniard, some of my childhood recipes might be difficult to explain. I do have a suggestion: I’d love to see the calories+proteins+carboh of each recipe. It would help so much… specially when preparing them for ill children! My grandfathers soft molasses cookies we also had homemade root beer. Super wonderful. My childhood favorite is my mom’s apple crisp. I remember trying to eat the topping before it went on the crisp 🙂 Chicken fajita night was pretty popular too…mmm mexican! I think my favorite childhood recipe is my mom’s chicken and potato soup (haha like chicken noodle soup but with russet potatoes). My last night at home (two days ago), my mom made a batch for herself (with some bread I made) while I made her birthday tiramisu! Although I’m vegan now (wooh!) and couldn’t have any soup, just the smell of it made me smile as we talked all evening. I hope you’re doing ok and these waffles cheer you up (maybe with some hot chocolate? 😉)! freezer friendly waffles are my jam! I’ll be saving this for meal prep! Favorite childhood dish was my mom’s penne pasta covered in a creamy white cheese sauce with crushed up bacon, ground black pepper and occasionally some peas thrown in. Soooo good, but pretty heavy too. Excited to try your freezer waffles!!! P.S. Made your Korean BBQ shrimp skewers yesterday for my Dad’s birthday and they were a hit! He loves shrimp! Thank you for your amazing recipes! Besides eggs we had sandwiches or leftovers for breakfast..
My memories of childhood meals are from the 1980’s when the boxed convenience meals were all the buzz. My mother, however, new how to make these taste like a homemade dish. Mainly, my brother and I didn’t know any better. My favorite meal as a child was Shake n Bake chicken with Kraft Macaroni and Cheese. And, yes folks, that either came with an applesauce or a fruit cocktail cup. Oh boy! My grandma would cook eggs and bacon in a skillet, and then press halves of buns down into it, making a sort-of egg & bacon pizza. Best breakfast ever. 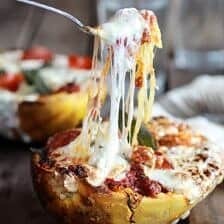 Would regular milk work in this recipe? My favorite thing that my made for me was roast beef in the crock pot with a Lipton Onion soup mix packet and mashed potatoes and green beans. My favorite!! hands down….mashed potatoes and gravy….all homemade! A regional item that came over from Cornwall England to the upper peninsula in Michigan that the miners wives made, called Pasties. My Grandma made them during Depression era and taught my Mom, who made THE best version. Fortunately before she passed, I spent a day in the kitchen learning how to make them too. Flaky homemade pie crust that is filled with stew meat, potatoes, onion (and traditional recipe has rutabaga’s) and just S & P to season. I still use the meat grinder from Mom to grind the mixture. Filled generously -sprinkle with pats of butter, crimp into a turnover of sorts-slit the top and get them golden brown on the bottom. Our family loved them with ketchup. The Yoopers up north, also pour gravy on them. They are comfort times a 1,000 and so delicious! I took the survey. I loved making cinnamon and sugar pancakes. Filled in the survey! My favorite special request food was banana cream pie. My mom made all the componenets from scratch. So delicious! My mom used to make something she called spaghetti pie. It basically was spaghetti in a casserole dish with meat sauce in the middle and baked. My Slovenian grandmother’s potica and apple strudel. She taught me how to make strudel soon after I was married. My great grandmothers chocolate mousse pie….amazing!